Recently a reader on Facebook reached to ask for ideas on what to serve when you are having company. For many this can be challenging, especially if guests are expecting a rich, carb-laden meal. 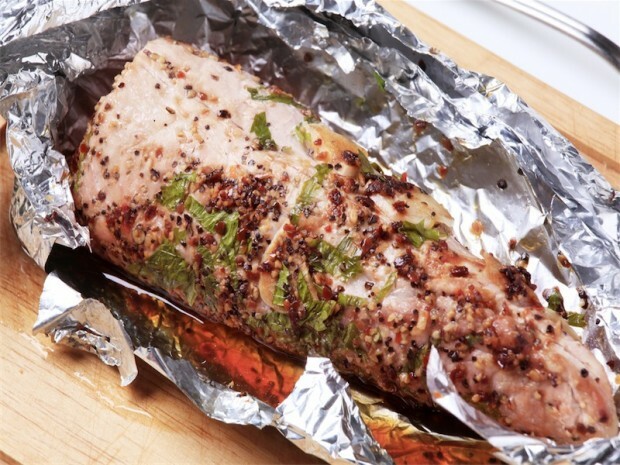 However your guests won’t miss anything if you serve this delicious roasted pork tenderloin. Cooking it in the oven wrapped in tinfoil ensures it won’t dry out and will help you infuse tons of flavor. 1. Bring a saute pan to medium high heat and quickly sear the pork tenderloin on all sides. It will take about 1 minute for each side or until it is nicely browned. 2. Get out your heavy duty aluminum foil and place the pork loin in the center. Cover the top with the garlic, fresh herbs, salt, pepper, and peppercorns. 3. Add the chicken broth and fold to completely cover the pork loin, making sure all sides are tightly sealed. It is recommended to leave a meat thermometer sticking out so you can gauge the temperature. Place in a roasting pan or dish to catch any excess liquid. 4. Cook for 20-30 minutes per pound or until the meat thermometer reaches 165 degrees. Let rest for 10 minutes and serve.